Note: This article was written prior to yesterday's sad news. Kenny J: There are quite a few books on my pull-list this week, and as a result certain ones whose franchise originated outside comicdom may have to stay on the shelf for now. 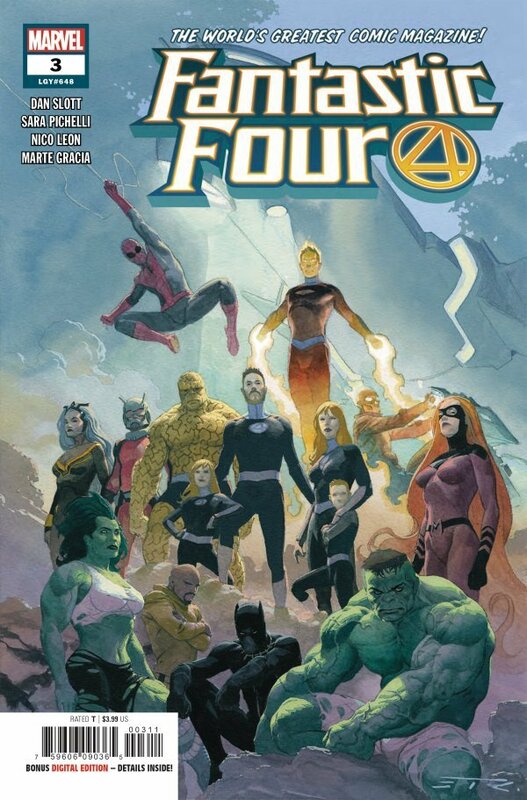 Arguably the world of Marvel comics is following its movie counterpart more and more but that hasn’t quite reached the Fantastic Four, at least yet. Although the book has been gone for a long time, and issue #3 has seen delays, it seems like Reed and Sue Richards and the Future Foundation never left us. This is both a benefit and a detriment to the book - although it is great to have them back I feel they have been denied the grandeur their reintroduction deserves. This hasn’t stopped me being intrigued as to where Dan Slott will take these characters though. His stewardship of other books has been masterful so I know Marvel's First Family are in good hands. Over at DC I will be picking up Catwoman #5. The story is unfolding slowly which is fine. It just means there is going to be more Joëlle Jones art to look at. She is the perfect artist for Selina Kyle, able to render her elegance in both her civilian and Catwoman costumes while the fight scenes allow you to feel every punch. Next up there are two titles I have been waiting a while for. Uncanny X-Men makes its return in a new volume; the original and, in my opinion, the quintessential X-title has been gone for far too long. With three writers that are creating great work in other parts of the Marvel Universe, I'm hoping it will be worth the hefty cover price. I will in fact be buying one movie-linked book but as it's issue #1 of the comic adaptation of William Gibson’s unused Alien 3 screenplay, I’m sure you can understand! It is fun to see something you thought would never get an outing in a visual format come to life. I’m hoping this project at Dark Horse is such a success that we get to see other unrealised film projects come to our medium of choice. I’m not quite sure if I’m looking forward to Uncanny X-Men or my next title more as this week also sees the twelfth and final issue of Mister Miracle released. Tom King is arguably the best comics writer working at the moment and this book is a template of how the modern superhero comic should be made. I will be sad to see it end. Andy H: A couple of 'landmark' issues from Marvel this week. First up is Avengers #10 or #700 in old money. After the brutal events of last issue I wonder what Jason Aaron has in store for us and our heroes in this bumper edition. Joined by a host of artists, including Ed McGuinness, Adam Kubert and Andrea Sorrentino I'm pretty sure it's at least going to look great. Next we have the return of one of the most iconic titles in comic history as Uncanny X-Men returns to our shelves and pull-lists. While there has been no shortage of mutant titles, this is the name that carries the most clout for X-fans. Hot talent Ed Brisson, Matthew Rosenberg and Kelly Thompson share the writing duties for this ten-part (weekly) story. The fanboy in me is really looking forward to this but I can't help being disappointed by Marvel and the $7.99 price tag they've stuck on it. Staying at Marvel, we have Thor #7 which delivers a tale of young Thor. Always a hoot as this younger version is so brash and headstrong plus it features the art of Tony Moore and I can't wait to see how that looks. Hold on to your brown coats, Firefly is back. Now at its new home, BOOM! Studios we get to learn more about the early days of the crew of Serenity and what part Mal played in the War of Unification. I wouldn't be lying if I said I was gorram excited by this!